Right now, forests absorb global-warming pollution. But that's changing as temperatures rise. As a tree grows, it pulls carbon out of the atmosphere and stores it in its leaves, wood, and roots. But when a tree dies, that stored carbon is released. Brandon Collins is with the U.C. Berkeley Center for Fire Research and Outreach. He says the amount of carbon absorbed and stored in forests is currently more than the amount they emit. But that’s starting to change. There are lots of reasons: deforestation, pests, and storms can all disturb the balance. Another culprit is fire. As climate change causes temperatures to rise and droughts to become more frequent, large intense wildfires are becoming more common. 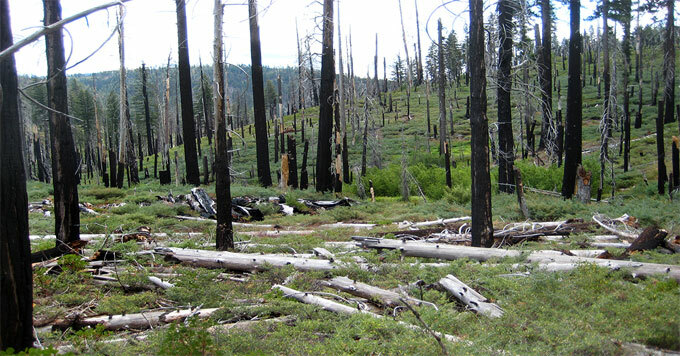 To make things worse, very intense fires can make it difficult for forests to reseed themselves. So not only has carbon been released into the atmosphere, there will be fewer growing trees to absorb it in the future. With fewer trees to store carbon, climate change will likely get worse, and that puts forests at even greater risk.